Nowadays you can see many juice bars in every corner of the street. No doubt investing money in starting a juice bar business can be a profitable venture. The demand for juice bars can never diminish this is because of the health benefits one can enjoy by drinking various fruit juices. Food habits of the people kept changing time to time; nowadays we hardly get quality food. Due to consumption of poor quality food stuff we are ending up in the hospitals with various health issues and diseases. This kind of health complications prompted many people to come up with juice bars that offer various fruit juices that can fight against any disease. No doubt juice bars are good business to start. We need to consider many things to excel in this business. Even though this is a profitable business idea we still need to compete with our competitors by following profitable juice bar business plan. To withstand cut-throat competition from them in the market, we need to make business strategies that help us to stand special and most liked juice bars in the market. Below points explain how to start this juice bar business, tips to run this business and material we need, labor, maintenance, profits and location. This is the foremost point to keep in mind before we start this juice bars. We should be able to offer all kinds of fruit and vegetable juices because different people likes different fruit juices so to meet such demand we need to offer all kinds of fruit and vegetables. We need offer fruit juices to customers in different flavors. If we search the internet we can find varieties of fruit juices with variety of flavors. Adding up two fruits and making a mixed fruit juice can help us a lot to attract customers because customers always look for varieties every time they visit a juice bar. If they find a new kind of juice then they never hesitate to taste it. You need to offer juices with a unique. Not only just fruit made juice but we should also offer vegetable juices to customers. This is one unique way to attract customers. You should make them know that even vegetable juices fight diseases. You need to apply for license from your concerning food authority of your country. They will do some manual investigation and will give you license in no time. Follow their guidelines to get your license hassle free. Before you start juice bars you need find the ideal location. The ideal location would be shopping malls, theaters, offices, parks, and gyms. For instance, take a gym, those who workout and goes to the gym on a regular basis will always look for juice. If we open a juice bar near a gym then you are making good returning customers. Even other public places also help to attract customers. 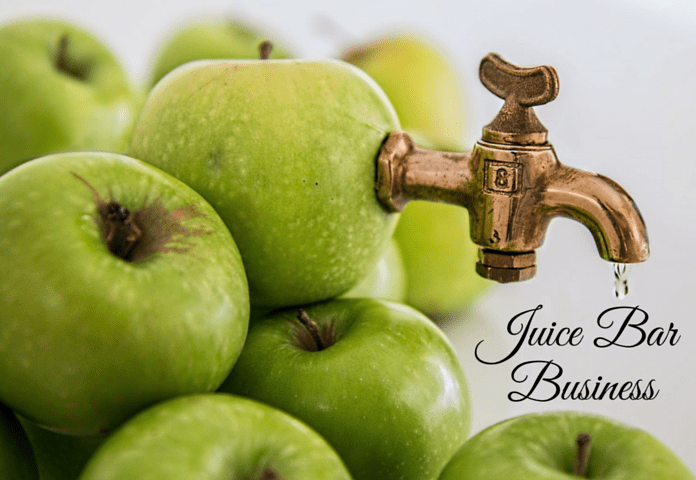 In order to run your juice juice bar smoothly, you need to purchase essential equipments for extracting juice from fruits and vegetables. Buy juicer and grinder to serve your needs. Also, consider buying eco-friendly glasses and dustbins. Serving all kinds of juices that too high-quality juices to customers in less time can work in our favor to win their hearts. Charging affordable price can also help us a lot to make profits. Health conscious people never hesitate to spend any amount of money, if you are offering quality and best juice in the market. Try to paste poster across the walls of the stall about health benefits one can enjoy drinking various fruit juices. This way they can select the best-suited fruit juice for their health. It doesn’t need a huge amount of money to start this juice bar business. You need to spend on mixers, blenders, ice machine, juicers, chairs, milk and also good look glasses and fresh fruits and vegetable. Make sure you are buying quality fruits and vegetable that too naturally grown. If you start this business its better you hire your family members who look after the business and help you in serving juices to customers and cash from them. This way you can cut labor expenses. If it is a franchise then you need to get perfect space, for this, you need to pay rent. If it is roadside juice bar then you don’t have to pay any rent. People tastes keep changing time to time, they expect different flavored fruit juices so always be innovative and try to offer them unique and best fruit juices all the time. This will keep the business grow day by day. Innovative ideas will make your juice bars stand unique in the market. This is what customers expect from you. Always be prepared for any competition from your competitors and learn to vanquish your competitor. A very useful article to what you need to know if you’re planning to open a juice bar or any food business.